Happening Now is a feature designed to bring updates, announcements and info on news items throughout the day. You are invited to participate. See a road closure? A business opening? A smoke plume? Storm-related mishaps like downed trees, power lines, road or other flooding? Email us at news@yubanet.com or call 530-478-9600 to let us know. You can also text us at 530-409-9888, but please don’t text or call while driving. Thanks! September 30, 2016 at 9:10 PM Report of a vegetation fire on South Brewer Road and Moore Road in Lincoln, possibly started by a vehicle. Numerous resources en route. September 30, 2016 at 7:36 PM Report of a possible vegetation fire on German Bar Mine west of Graniteville and north of Washington on the Middle Fork of the Yuba. 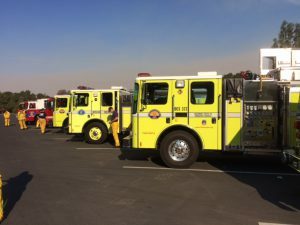 CAL FIRE, North San Juan, Camptonville and Washington Fire are responding. This is in a very remote area, a helicopter has been called to locate the fire. September 30, 2016 at 7:25 PM We have no confirmed information about the ongoing law enforcement activity near Penn Valley Road and Lake of the Pines. For clarification, those are two separate incidents. September 30, 2016 at 1:58 PM Report of a vegetation fire on Dorsey Drive in Grass Valley. Reported as a small spot, possibly extinguished, behind the Grass Valley Terrace Apartments. Numerous engines en route, use caution in the area. September 30, 2016 at 1:36 PM Vista Fire has been contained at 13.4 acres. September 30, 2016 at 1:14 PM Walarga IC reports the fire contained at 3 acres. Walerga Road is open. September 30, 2016 at 1:04 PM New fire, Walerga and Spring Hill Drive in Roseville. Walerga IC reports approximately 4 acres, the northbound lane of Walerga is blocked. CHP is en route for traffic control. September 30, 2016 at 11:54 AM Air Attack 230 is over the fire, recommends ordering two additional helicopters. September 30, 2016 at 11:47 AM Better location for the reported fire appears to be Vista Bella Drive, across from Big Hill Road in Auburn. Possible structure involvement. September 30, 2016 at 11:44 AM Full wildland dispatch to a reported fire in the Wise Road and Mt. Vernon Road in the North Auburn area. September 30, 2016 at 7:17 AM Rain, mountain snow and much cooler temperatures this weekend. A early season low pressure system is forecast to move through northern California over the weekend. This will bring much cooler temperatures, periods of light rain and mountain snow Sunday and Monday and possibly even isolated thunderstorms Sunday afternoon and evening. 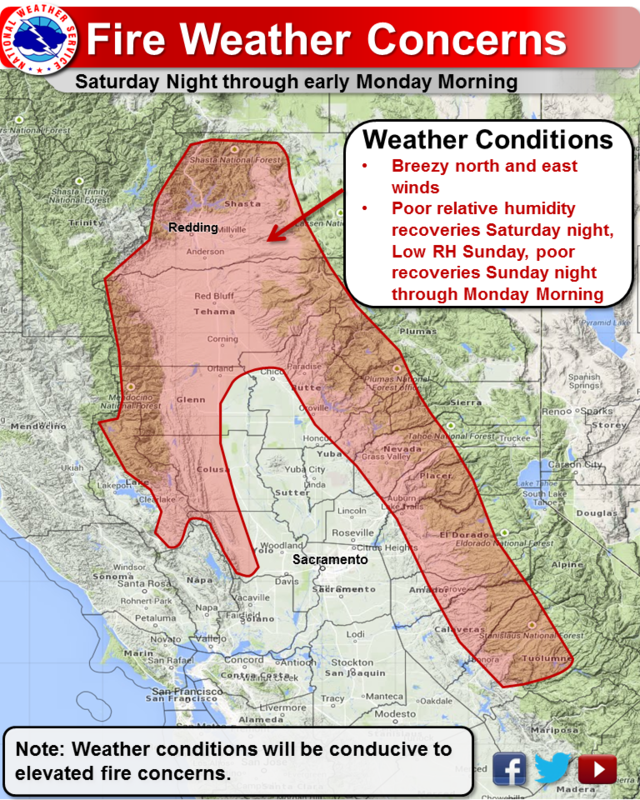 September 29, 2016 at 8:05 AM Storm moving across NorCal late Saturday night through Monday. Near normal temperatures today then a cooling trend through the weekend with daytime highs 15 to 25 degrees below normal by Sunday. Chance of showers and isolated thunderstorms Sunday into Tuesday. Drier by the middle of next week. A warming trend next week. September 28, 2016 at 11:28 AM Traffic hazard on westbound Hwy 20 at Pleasant Valley Road in Penn Valley. Truck with no gas cap is spilling diesel onto the roadway. September 28, 2016 at 10:44 AM Butte County/CAL FIRE Fire crews at scene vegetation fire near Batchlor Point, west of Pulga. Ground crews and aircraft working the incident. Fire reported at one acre in steep, rugged terrain.Washington Ridge crew on order to the incident, aircraft from Grass Valley also assigned to the incident. September 28, 2016 at 9:53 AM Solo vehicle accident on Alta Sierra Drive, use caution in the area. Reported as a non-injury accident by the first unit at scene. September 28, 2016 at 8:10 AM Cool down begins today, precipitation by Sunday?! Cool down begins today with much cooler temperatures by the end of the week as a weather system moves toward NorCal. Chance of precipitation early next week. September 28, 2016 at 12:02 AM First engines at scene on Rodeo Way have extinguished the fire. All engines still en route are being canceled. September 27, 2016 at 11:52 PM Report of a residential structure fire on Rodeo Way across from Wellswood Way south of Grass Valley. Numerous units en route. Reported as a fire in the laundry room. September 27, 2016 at 12:22 PM Reports from locals in the Town of Washington state a suspect stole a car from a resident unloading their groceries. The suspect then broke through the gate closing off Maybert Road. Reportedly, he fired shots while driving. Now law enforcement is searching the cabins and clearing them one by one. Please stay indoors. September 27, 2016 at 11:43 AM Walsh Fire is contained. Releasing some of the resources. September 27, 2016 at 11:27 AM Non-injury accident on Hwy 174 at Arrowhead Lane. A solo vehicle into a tree. Use extreme caution, the accident is just past a blind curve. Reduce speed and watch for emergency vehicles on scene. September 27, 2016 at 11:24 AM Nevada County Sheriff’s Office and CHP, assisted by a helicopter, are handling an incident on Maybert Road in the Town of Washington. Avoid the area. 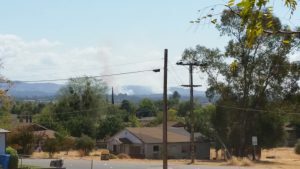 September 27, 2016 at 11:11 AM Drift smoke from the Tobin Fire has reached Butte, Yuba and Nevada counties. September 27, 2016 at 11:09 AM Good progress on the Walsh incident. Helicopter 514 has been released and is returning back to Whitecloud. Tanker 88 has been released as well, returning to Grass Valley with half a load of retardant. September 27, 2016 at 10:52 AM First unit has arrived at the Walsh incident in Smartsville, approximately 1 acre burning in light oak woodlands at a slow rate of spread. September 27, 2016 at 10:41 AM Report of a wildland fire on Walsh Lane in Smartsville. Reported on a ridgeline, full wildland dispatch on order. The fire is reported as approximately 1 acre. September 27, 2016 at 8:28 AM Potentially last hot day of the season, change in weather coming. Today will likely be the last day this season for the potential of reaching triple digits across the interior of NorCal. A change to a cooler weather pattern will take place during the second half of the week as a low pressure system develops just off the West Coast. September 26, 2016 at 8:18 AM An injured deer, struggling on the roadside at on Hwy174 / Cedar Ridge Dr. 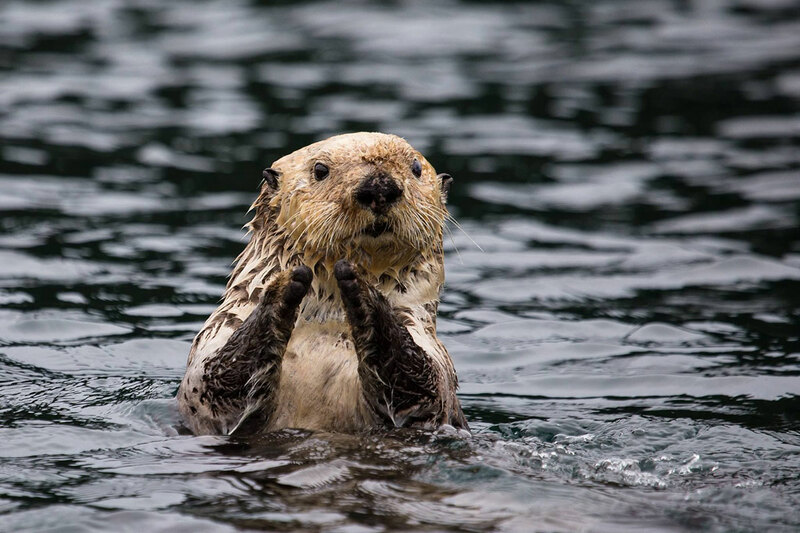 Slow down and watch for wildlife! September 26, 2016 at 8:11 AM Several dead raccoons in the roadway at Penn Valley Dr / Ranch Rd in Penn Valley. September 26, 2016 at 7:02 AM Another hot day ahead. Dry weather continues. Above average temperatures through Tuesday, then cooling trend begins Wednesday. September 25, 2016 at 6:59 PM Caltrans: Roadway clear on WB I-80 near Rollins Lake Rd due to earlier multi vehicle crash. September 25, 2016 at 6:57 PM Smoke check in the Idaho-Maryland Road area in Grass Valley. September 25, 2016 at 6:37 PM The reported fire at China Wall has been declared a false alarm. Aircraft and engines leaving the area. Firefighters are still unable to locate any smoke. Canceling the CAL FIRE resources and the tanker. The area received a few lightning strikes last week. Recon is continuing. September 25, 2016 at 6:16 PM Air resources over the reported China Wall fire have not located any smoke, continuing recon. September 25, 2016 at 6:07 PM Air Attack 17 and Helicopter 514 to the fire at China Wall. September 25, 2016 at 6:02 PM Reported vegetation fire on the American River District of the Tahoe National Forest near China Wall OHV staging area. Full wildland response ordered. September 25, 2016 at 2:28 PM Both CAL FIRE tanker (88 and 89) and the Air Attack plane are assigned to the Sawmill Fire and another smaller fire in Solano County. Forest Service Air Attack 17 and Helicopter 514 are available for any incidents in Nevada, Yuba or Placer counties. September 25, 2016 at 9:18 AM Gusty northerly winds and dry conditions will cause critical fire weather conditions this weekend. Locally breezy north winds mainly for the west side of the valley and for some foothill and mountain locations will continue today although the foothill and mountain winds should taper by noon. The winds in the mountains will increase once again this evening with local gusts up to 35 mph into Monday morning. September 24, 2016 at 7:19 PM Westbound I80 is closed and traffic is being turned around back eastbound at Overland Trail. Heavier traffic should be expected on Glenshire Dr. I80 westbound will be closed for the next several hours due to CHP activity, per Truckee Police. 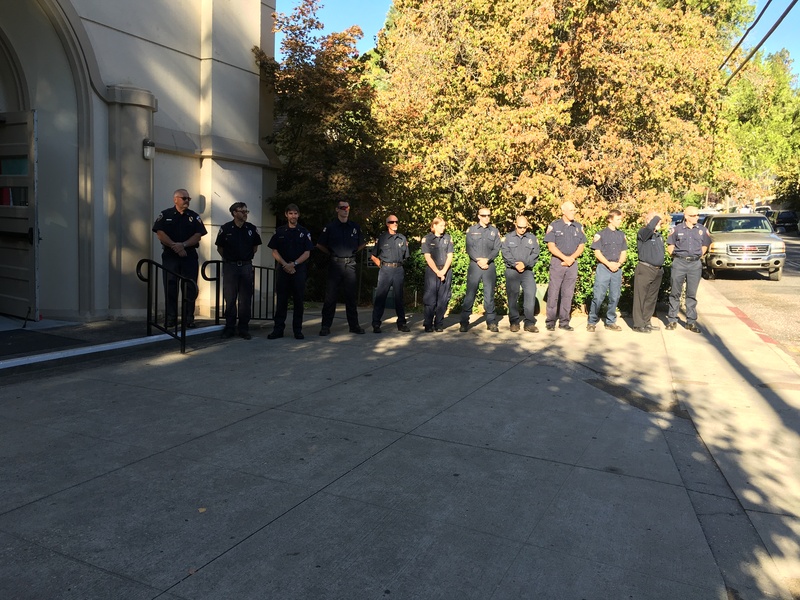 September 24, 2016 at 10:51 AM North San Juan Firefighters at Al Hoffmeyer’s service this morning. September 23, 2016 at 4:24 PM Per CAL FIRE: The Bell Fire, off Hwy 49 and Bell Road, 4 miles north of Plymouth (Amador Co) is 25 acres and 20% contained. 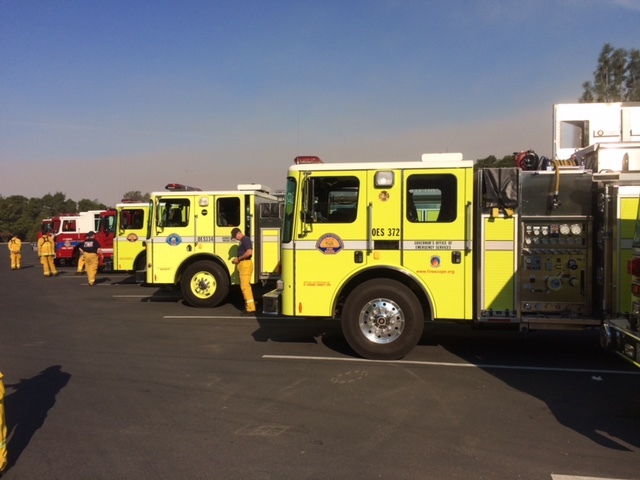 September 23, 2016 at 11:20 AM First units have arrived on scene at LaBarr Meadows Road. Only one more engine to continue in, all others can cancel, including dozers, crews and aircraft. September 23, 2016 at 11:10 AM Fire located, reported as a motorhome on fire with extension to the vegetation on LaBarr Meadows Road at Twin Pines. Units en route. September 23, 2016 at 11:06 AM Smoke report from both Wolf Mountain and Oregon Peak lookouts for the Grass Valley area. September 23, 2016 at 10:28 AM A trash can and other debris in the #2 lane on southbound Hwy 49 near Combie Road. Use caution in the area. September 23, 2016 at 7:31 AM Warm weekend ahead, with breezy north winds. High pressure over the west coast will bring a warm weekend to Northern California with sunny skies and light northerly breezes. The first weekend of autumn will see daytime highs from 5 to 10 degrees above normal. September 22, 2016 at 7:24 PM Units on scene at Willow Valley Road can handle. September 22, 2016 at 6:56 PM Residential structure fire, reported as an oven fire, on Willow Valley Road in Nevada City. Units are en route. September 22, 2016 at 6:39 PM Vehicle accident, unknown injuries on Pleasant Valley Road and Bitney Springs Road area. Units en route. September 22, 2016 at 2:15 PM Turn your headlights on and reduce speed. Roads are slippery with oil residues and leaf litter, first rain! September 22, 2016 at 1:55 PM Thunderstorms are developing in Plumas, Sierra and Nevada counties. September 22, 2016 at 12:31 PM Per Butte County Fire: Responding to vegetation fire in the area of Oro Bangor Hwy x Swedes Flat. Multiple fires in the area. 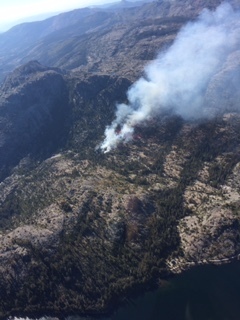 September 22, 2016 at 11:56 AM Tahoe National Forest Helicopter 514 is responding to the Bangor Fire. September 22, 2016 at 11:46 AM Report of a vegetation fire in Butte County Oro Bangor Hwy and Miners Ranch Road. Butte County/ CAL FIRE responding, with additional units from CAL FIRE Nevada-Yuba-Placer en route. September 22, 2016 at 10:55 AM Saddleback Lookout on the Tahoe National Forest north of Downieville is reporting light to moderate snow showers. The lookout is at a 6,625 ft elevation. September 22, 2016 at 10:15 AM Aircraft and firefighters are in the area of the reported fire, nothing showing. This will be UTL (unable to locate) and all units are returning to their stations. September 22, 2016 at 10:05 AM Fire possibly located off Gayle Lane or Bubbling Wells Road. Helicopter 514 is en route to the incident. September 22, 2016 at 9:57 AM Report of a possible vegetation fire on Sutton Way near Idaho-Maryland Road in Grass Valley. Wildland response is being dispatched. September 22, 2016 at 7:16 AM First day of Fall: Breezy, cooler than normal. A low pressure system passing through northern California will bring much cooler temperatures today. Daytime highs are forecast to come in from 5 to 10 degrees below normal on this first day of autumn. September 21, 2016 at 6:57 PM Firefighters report a large spot and they can handle with the resources at scene. September 21, 2016 at 6:52 PM Numerous engines, with aircraft on order are being dispatched to a vegetation fire on Oak Lane in Pilot Hill. First unit at scene reports about 1/4 acre. All units to continue in. September 21, 2016 at 3:59 PM Non-injury accident on Agony Hill Rd / Lower Colfax Rd in Grass Valley. Use caution in the area. September 21, 2016 at 10:36 AM Firefighters on scene at Echo Valley Dr. are mopping up the small spot. PG&E en route to restore power to the immediate area. September 21, 2016 at 10:13 AM Possibly a bird into the power lines, caused a power outage in the Banner area. Reporting party states the fire is out, but in a remote area. Firefighters are hiking in. Aircraft response has been canceled. September 21, 2016 at 10:09 AM Full wildland dispatch for a reported vegetation fire on Echo Valley Drive off East Lime Kiln Road in Alta Sierra, possible power lines down. September 21, 2016 at 10:01 AM Per NWS Sacramento: Breezy winds today, especially in the Sierra, as weather system moves onshore! Secure loose objects! September 21, 2016 at 8:16 AM From Truckee Fire: A strong cold front will bring gusty winds today with hazardous fire weather and lake conditions. Showers and isolated thunderstorms are possible east of the Reno-Tahoe region. Much cooler temperatures are expected Thursday with brisk winds, light rain showers and very light snow possible in the Sierra. Dry weather returns Friday with a warming trend through the weekend. Main concern for this afternoon is the combination of critically dry fuels and wind gusts over 40 mph. Latest simulations suggest peak gusts could exceed 55 mph in wind prone locations along the Sierra Front. September 21, 2016 at 8:11 AM Red Flag Warnings, much cooler and breezier today and tomorrow. A low pressure system off the coast of the Pacific northwest will bring a variety of weather to Norcal today starting with light showers this morning across the southern forecast area. Breezy winds will bring increased fire danger over portions of the Sierra Cascade crest and eastward. The main low itself will bring a threat of thunderstorms to the far north state this afternoon and evening. Finally, all areas will see cooler temperatures today. An Air Force U-2 Dragon Lady crashed shortly after takeoff at approximately 9:05 a.m. today near the Sutter Buttes. One pilot is confirmed deceased, while the other sustained injuries. The aircraft was assigned to 1st Reconnaissance Squadron, Beale Air Force Base, California and was on a training mission. Two pilots were on-board and ejected the aircraft. The incident is currently under investigation. Additional details will be provided as they become available. September 20, 2016 at 10:10 AM A U2 training plane has crashed on the south side of the Sutter Buttes in Yuba County. Reports indicate that 2 pilots ejected. September 20, 2016 at 8:39 AM Accident in front of the Bear River High School, law enforcement on scene because of one very irate driver. September 20, 2016 at 7:59 AM Vehicle accident on South Auburn and McKnight in Grass Valley. Engines en route, please use caution in the area. September 20, 2016 at 7:56 AM Yo-yo weather brings Autumn Tease, then Summer serial continues. A quick, but brief pattern change is expected to occur just in time for the Autumnal Equinox which occurs Thursday, the 22nd, at 721 am PDT. It will feel like autumn, right on cue on Thursday, with high temperatures some 25 degrees cooler than today. 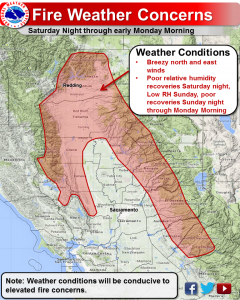 A weather is forecast to drop southward over Norcal by midweek, bringing not only the cooling trend, but also breezy winds and chance of mountain showers and thunderstorms, mainly over the Sierra Nevada and Shasta County mountains and foothills. September 19, 2016 at 5:37 PM Vehicle accident westbound Hwy 80 near the Bowman off ramp, one Forest Service vehicle on scene. Water truck blocking the slow lane. September 19, 2016 at 4:31 PM First unit on scene at Golden Star reports the fire is now extinguished, incoming units are being canceled. September 19, 2016 at 4:27 PM Residential structure fire, reported as a kitchen on fire, on Golden Star Road in the Grass Valley area near Allison Ranch Road. Numerous engines en route. September 19, 2016 at 4:20 PM Campfire reported near Dutch Flat on Powerhouse Road, units are en route. No campfires allowed in the area. Photo by Daniel Clark from Mammoth Mountain. September 19, 2016 at 3:06 PM Heavy smoke over the summit and in the Truckee area, now creeping into western Nevada County too. 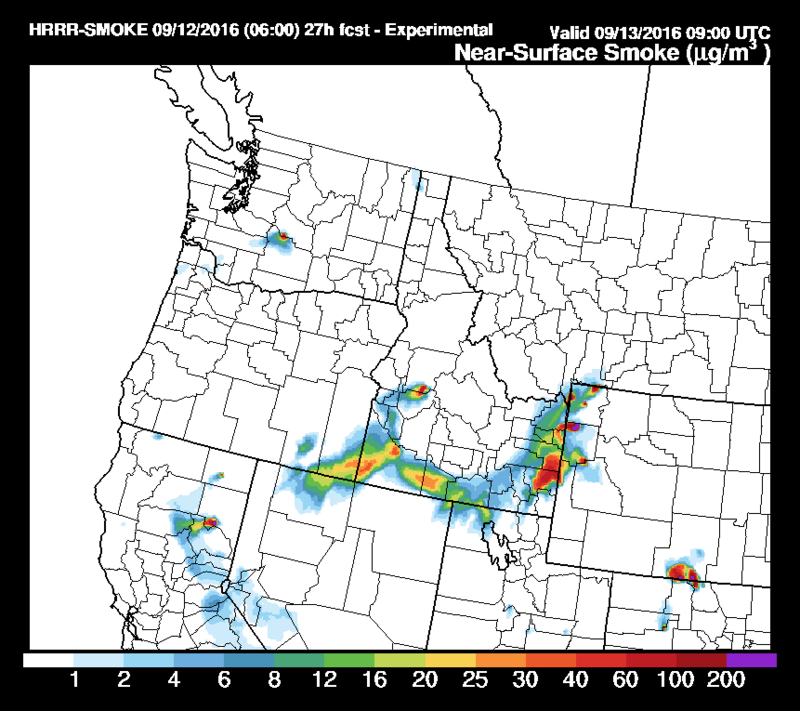 The smoke is from the Owens River Fire on the Inyo National Forest. No active local fires at this time. September 19, 2016 at 1:13 PM A short explainer on how fires get their names. September 19, 2016 at 10:49 AM The trails at Empire Mine State Historic Park are reopening, with some restrictions. September 19, 2016 at 10:48 AM Hot today, then a precipitous 25-degree drop in temperature by Thursday. Potential for new fire starts due to lightning. Possible rapid fire spread from breezy (mainly ridge top winds) and dry fuels. September 18, 2016 at 10:27 AM Because of continued mop up operations and dangerous conditions with trees affected by the fire, all trails in the Empire State Park are closed by Posted Order CCR 4326 from Osborne Hills to Penn Gate. There will be no trail access on any trails across from Union Hill for at least 24 hours. September 18, 2016 at 9:15 AM Great progress on the Auburn Fire overnight. Please watch for fire engines and equipment in the area! September 17, 2016 at 11:47 PM First units have arrived at Bullards Bar Dam Road, reporting a small spot only, can handle with one additional engine. September 17, 2016 at 11:35 PM Reported roadside spot on fire on the east side of Bullards Bar Dam. Units are en route. September 17, 2016 at 11:17 PM The smell of smoke in the Grass Valley/Nevada City and surrounding areas is from the Auburn Fire. There is no other active fire at this time in Nevada County. September 17, 2016 at 4:17 PM Air Tac reports 1/2 acre with the structure fire near Rex Reservoir Road. Requesting one additional helicopter to respond. Fire is burning in light flashy fuels, getting into heavier brush. September 17, 2016 at 4:17 PM Air Tac 230 is reporting a new fire, fully involved structure with extension to the wildland in the Hwy 20 and Rex Reservoir Road area. September 17, 2016 at 1:32 PM Report of a vegetation fire of South Brewer Road in Lincoln, reported as a roadside spot the size of a house. Units are en route. September 17, 2016 at 1:18 PM Reported vegetation fire on Sawmill Lake, full wildland response on order. 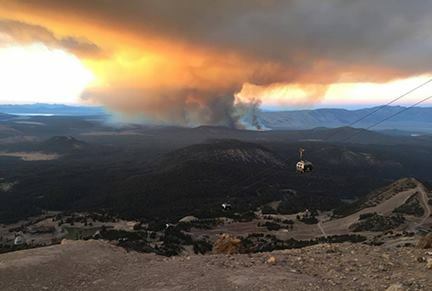 The fire is on the Tahoe National Forest, southwest of Bowman Lake. September 17, 2016 at 11:34 AM Rough IC is canceling all units with the exception of 2 engines that will continue to check the area. September 17, 2016 at 11:30 AM All units en route to the reported fire are reducing their response to code 2 (no sirens) – still no fire located. September 17, 2016 at 11:28 AM Firefighters have checked the Twin Cities area thoroughly, nothing found. Air Attack 230 is over the area now, searching. September 17, 2016 at 11:23 AM Units are in the area, attempting to locate the fire. So far nothing visible. September 17, 2016 at 11:20 AM Full wildland dispatch now on order to the fire at Twin Cities. September 17, 2016 at 11:18 AM Horse trailer fire with extension to the vegetation on Rough&Ready Hwy across from Twin Cities Church in the Grass Valley area. Units en route. September 17, 2016 at 9:12 AM Dry with above average temperatures through early next week. High pressure over the west coast will bring fair skies and warm temperatures over the next few days. Daytime highs over the weekend are forecast to come in between about 5 and 10 degrees above normal but are not expected to get into record territory. Cooler temperatures are expected through most of next week. September 16, 2016 at 3:16 PM Vehicle down a cliff on Tyler Foote Crossing Road. North San Juan Fire en route. September 16, 2016 at 8:31 AM Purdon IC reports the driver is walking around, possibly non-injury. Firefighters assessing the patient now. September 16, 2016 at 8:27 AM Units have arrived on scene, reporting the vehicle is on Purdon Road, blocking one lane. Requesting a flatbed wrecker. September 16, 2016 at 8:19 AM Overturned truck, no one inside, on Montezuma Lane across from Purdon Road. North San Juan Fire, CHP and tow truck en route. September 16, 2016 at 7:11 AM Dry and warming up through Tuesday. High pressure over the western U.S. will bring fair skies and warm temperatures to northern California over the coming weekend. Daytime highs Saturday and Sunday will run around 5 to 8 degrees above normal for mid September. September 15, 2016 at 1:29 PM First unit on scene has contained the fire on I-80. September 15, 2016 at 1:21 PM Report of a grass fire, caused by a blown-out tire from a vehicle, on eastbound I-80 at Dry Creek Road in the Auburn area. Units are en route. September 15, 2016 at 8:18 AM Units on Meadowlark have determined a propane tank was filled this morning, no hazard. All units are returning to their quarters. September 15, 2016 at 8:16 AM Dry and warm weekend ahead. High pressure over the western U.S. will bring fair skies and warm temperatures to northern California over the coming weekend. Daytime highs Friday through Sunday will run around 5 to 8 degrees above normal for mid September. September 15, 2016 at 7:59 AM Possible gas hazard, smell of gas on Meadowlark Court in Lake Wildwood. Units are en route. September 15, 2016 at 7:44 AM Late report on the structure fire on Sacramento Street in Nevada City. September 14, 2016 at 4:39 PM Firefighters are making access to the fire on Old Tunnel Road behind CVS, reportedly started by a transient attempting to cook food in a makeshift camp. Thanks to the passerby who reported it to 911 and us. September 14, 2016 at 4:32 PM Vegetation fire reported on Old Tunnel Road, across from Brunswick Road in the Brunswick Basin. Units are en route, watch for fire engines in the area. September 14, 2016 at 12:07 PM Fire on the Nyack off ramp now reported as possibly extinguished. Firefighters on scene can handle. September 14, 2016 at 12:02 PM Sparks coming from a vehicle towing a boat caused a fire on eastbound I-80 near the Nyack off ramp. Full wildland response en route. September 14, 2016 at 8:21 AM Dry with temperatures warming to above average by the end of the week. Temperatures will be making a rapid warm up over the next couple of days as high pressure builds over the west coast. Temperatures will then level off over the weekend with daily high temperatures coming in a few to several degrees above normal. September 13, 2016 at 7:08 PM Vehicle accident on Dog Bar Road and Myma Road in Alta Sierra. Units en route, possible power lines down. September 13, 2016 at 4:18 PM A stalled school bus on Brunswick Road at Idaho Maryland Road in the Grass Valley area – just past the intersection – is creating a hazard for drivers. Please use caution in the area. Thanks to reader Patti for alerting us! September 13, 2016 at 9:10 AM Unseasonably cool, scattered thunderstorms in the high country. Mild temperatures continue across interior NorCal today. High pressure returns after mid-week bringing a return of warmer readings. September 12, 2016 at 2:18 PM Truckee Fire Department reports: Crews have a wet line from hose around the Donner Fire just west of Donner Ski Ranch. Air Tankers and Helicopters made drops on the fire to contain it before crews could get a hose line around it. Air Tankers are being released and the Helicopter has about 20 minutes more work dropping water from their bucket. Crews will be on scene for the rest of the day mopping up. The cause is under investigation, however, it is likely that this fire started from a campfire that was not put out well enough. Make sure you put your camp fire out to the point that it is cold to the touch. Every year devastating fires are caused from escaped campfires like this one. Remember, we are in VERY HIGH FIRE DANGER. Even though temps are dropping today, a wildfire in dry conditions, pushed by wind, will move very quickly even on a day like today! September 12, 2016 at 12:35 PM Donner Fire is reported as approximately a 50 by 50 spot in heavy brush just west of the Donner Ski Ranch. September 12, 2016 at 12:32 PM Report of a vegetation fire on Donner Pass Road near the Donner Ski Ranch. Full wildland response on order. September 12, 2016 at 12:24 PM Report of a residential structure fire, possibly already extinguished, in Nevada City on Spring Street. Numerous units en route. September 12, 2016 at 12:24 PM Air Tac 230 is in the Lake of the Pines area, checking for reported smoke. Possibly dust from the mining operation on Combie Road. September 12, 2016 at 12:14 PM Small spot near the Dorsey Drive interchange has been extinguished. September 12, 2016 at 11:41 AM Report of a vegetation fire on northbound Hwy 49 at Dorsey Drive on ramp. Firefighters en route. 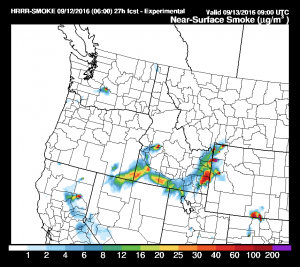 September 12, 2016 at 8:39 AM The experimental smoke forecast shows some of the smoke from the Willard Fire reaching our immediate area by tomorrow. September 12, 2016 at 7:16 AM A small fire on the Plumas National Forest in Strawberry Valley appears to have rekindled with strong winds overnight. Firefighters are en route. September 12, 2016 at 7:15 AM Critical fire weather danger expected later today into Tuesday. A weather system will develop over interior northern California, bringing much cooler high temperatures and a potential for Sierra Nevada showers and thunderstorms Monday/Tuesday. Then on Tuesday: A touch of early-season snowfall will be possible across the higher elevations of the Sierra Nevada to the south of Lake Tahoe early this week. Some of the high-Sierra mountain passes, including Highway 88 (Carson Pass), Highway 4 (Ebbetts Pass), Highway 108 (Sonora Pass) and Highway 120 (Tioga Pass) may see a little snow accumulation. September 11, 2016 at 2:20 PM Fire on Richardson has been mitigated. September 11, 2016 at 1:57 PM Reported structure fire at the intersection of Richardson Street and Church Street in Grass Valley. Units on scene. Use caution in the area and watch for engines. September 11, 2016 at 1:48 PM Extinguished campfire outside the fire rings at the Cal Ida campground. September 11, 2016 at 11:49 AM Vegetation fire in the Rucker Lake area on the Tahoe National Forest. Wildland dispatch underway. September 11, 2016 at 10:11 AM Firefighters now on scene at the Strawberry Fire report 1/2 acre, canceling some resources, including Air Tac 17 and Tanker 89. September 11, 2016 at 9:59 AM Air Tac 17 and one tanker are en route from Grass Valley to the Strawberry Fire. September 11, 2016 at 9:34 AM Vegetation fire on the Plumas National Forest, in the Sly Creek Reservoir area just north of Bullards in Strawberry Valley. Units are en route to the fire. September 10, 2016 at 10:02 PM Tree down, blocking the roadway on Combie Road near Rodeo Flat Road. Use caution in the area. September 10, 2016 at 5:14 PM Car fire on Alta Sierra Drive. Firefighters on scene. September 10, 2016 at 4:13 PM Firefighters were unable to locate any fire or smoke on Humbug Trail. September 10, 2016 at 3:20 PM CAL FIRE and Tahoe National Forest firefighters are checking for the reported smoke on Humbug Trail. September 10, 2016 at 3:01 PM Smoke check, hiker reports seeing smoke approximately 1/4 mile down on Humbug Trail near Malakoff Diggins. Firefighters en route to check it out. September 10, 2016 at 1:15 PM Vehicle 10-10 ft off the roadway on Hwy 20 at Lake Spaulding Road. Units en route. September 10, 2016 at 11:44 AM Hot today, then cooling trend Sunday through Tuesday. Above normal temperatures continue today, then cooling trend Sunday through Tuesday with a slight chance of mountain showers or thunderstorms. Dry Wednesday through Saturday with warming back above normal. September 9, 2016 at 4:32 PM The patient has been extricated, evaluated by medics. No transport to hospital necessary. Firefighters are leaving the scene. The FAA will investigate the cause of the crash. September 9, 2016 at 3:54 PM Firefighters have made access to the sole occupant. Injuries are reported as minor lacerations to the right arm. September 9, 2016 at 3:09 PM The Cessna is hung up approximately 25 ft in the air. Firefighters are making access and will attempt to lower the sole occupant to the ground. 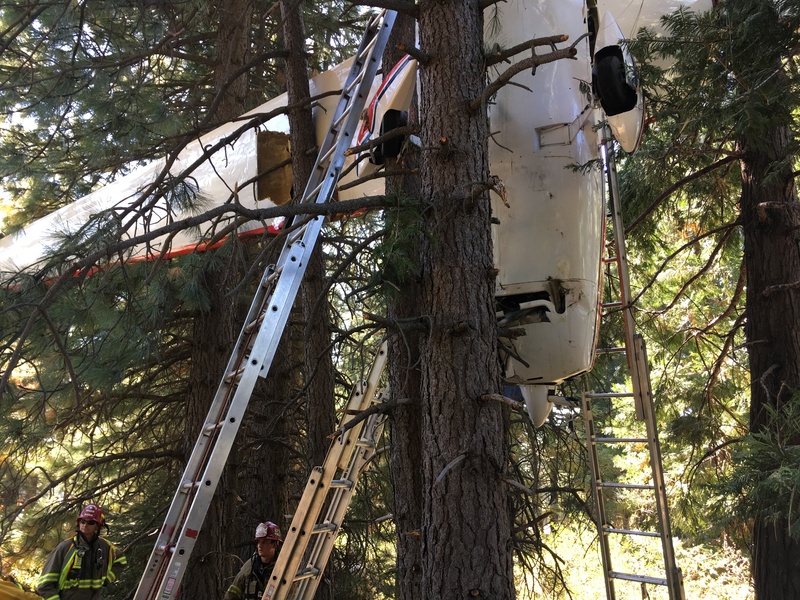 September 9, 2016 at 2:56 PM Per units at scene, one small Cessna is suspended in the trees in the median. One patient, with only minor injuries. Air ambulance has been canceled. September 9, 2016 at 2:51 PM The first unit at scene is reporting a small Cessna-type plane in the median, on eastbound I-80 at Blue Canyon. Traffic is not impacted as of now. However, use caution in the area as emergency services and CHP are on scene. Unknown number of occupants or extent of injuries. September 9, 2016 at 2:43 PM Air ambulance requested to the crash site. Per the CHP log, the propeller stopped working and the plane clipped trees. This is all preliminary information, subject to change. September 9, 2016 at 2:39 PM An aircraft emergency has been declared, possibly a glider or small plane down in the center divide on I-80. Possibly at the Nyack off ramp near Blue Canyon. Fire engines are en route. September 9, 2016 at 12:53 PM Fatal solo vehicle accident near Hwy 49 and Gold Flat. Use caution in the area, units will be remaining in the area. September 9, 2016 at 12:51 PM Units responding to a vehicle accident with reports of fire, Nevada City near Gold Flat. Units responding to a second vehicle accident Hwy 49 and Old Downieville Rd. Use caution in the area. 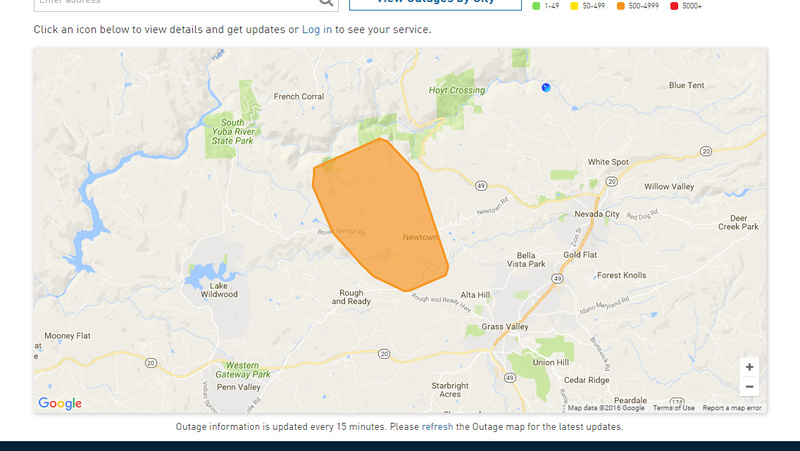 September 9, 2016 at 10:50 AM The outage has been reduced to 187 customers in the Bitney Springs Road area. Estimated time of restoration is 12:30 or earlier. 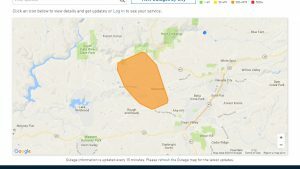 September 9, 2016 at 10:03 AM Power lines down causing an outage for 598 homes in an area from Rough&Ready Hwy to Newtown Road up to Jones Bar Road, fire and PG&E on scene. September 9, 2016 at 8:18 AM Happy CA Admission Day! 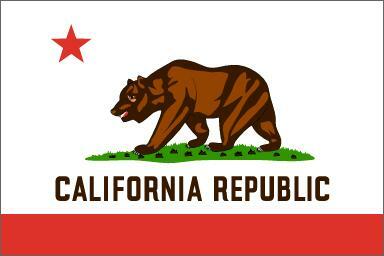 California became a state 166 years ago today. September 9, 2016 at 8:03 AM Per Nevada County Fire JOA: The dogs have been reunited! Remember to drive safe on your way in this AM. September 9, 2016 at 7:42 AM Nice weekend weather, then significant cooling ahead. A weather system is likely to bring much cooler weather to Northern California early next week. Depending on its strength and trajectory, it may bring Sierra thunderstorms, or possibly even some high mountain snow! September 8, 2016 at 6:40 PM Per Nevada County Fire JOA: Vehicle accident at Hwy. 49 South of McKnight, 2 vehicles involved with 2 patients. Scene is in the clean up stages watch for CHP on scene. September 8, 2016 at 12:24 PM From a parent: Due to a water main break in Lake Wildwood Williams Ranch School has no water so they’ve closed the campus and are sending the kids home. September 8, 2016 at 12:18 PM Accident on Hwy 49 at Alta Sierra Drive. The #2 lane is blocked. Use caution in the area. Another accident, with major injuries, has southbound Hwy49 blocked just north of Lone Star Road in the Auburn area due to a collision, there is no estimated time of clearing. September 8, 2016 at 12:07 PM According to a news release by the Tahoe National Forest, full containment on the Phoenix Fire is expected later today. Yesterday, over 6,000 gallons of retardant were dropped on the ridge lines, slowing the progress of the fire. September 8, 2016 at 8:22 AM Firefighters on scene at the Hammon Grove Park can handle the pile. Incoming units are being canceled. September 8, 2016 at 8:04 AM Report of a vegetation fire in Brownsville in the Hammon Grove Park. Reported as a small pile of smoldering leaves. Units en route. September 8, 2016 at 8:02 AM With very high fire danger 17 engines, 2 crews and 3 dozers are staffed today in the CALFIRE Nevada Yuba Placer unit. This is in addition to the local and federal resources. September 8, 2016 at 7:43 AM Dry, smoky and above normal temperatures. Dry with above normal temperatures through the end of the week. Hazy at times due to fire smoke. Cooling to a little below normal early to middle of next week. A slight threat of Sierra crest thunderstorms Monday and Tuesday. September 7, 2016 at 9:10 PM Firefighters are on scene at Elnora Drive, reporting no fire. PG&E has been advised. September 7, 2016 at 9:01 PM Power line down on Elnora Drive, near Indian SPrings Road. Powerlines are not arcing at this time. Firefighters en route. September 7, 2016 at 11:51 AM Report of a vegetation fire on Hammonton-Smartsville Road in Yuba County. Firefighters are on scene, reporting potential for about 7 acres max. 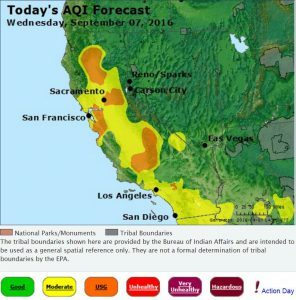 September 7, 2016 at 10:05 AM Per NWS Sacramento: Air quality forecast unhealthy for sensitive groups today. September 7, 2016 at 8:55 AM Additional engines and two water tenders requested to the Laporte Fire. Fully involved manufactured home with wildland extension on three sides. Access of Martin Road. September 7, 2016 at 8:40 AM Residential structure fire, with possible extension to the wildland on Laporte Road near Stagecoach Trail in Rackerby west of Brownsville, Yuba County. Large explosion heard and possibly trees on fire. Units en route. September 7, 2016 at 6:43 AM Firefighters are hiking to a fire in a very inaccessible area on Eagle Lake Road near Spaulding. Smoke is visible from Hwy 20 and I-80.No need to report this fire. September 7, 2016 at 6:42 AM Above normal temperatures, with a side of smoke. Dry with above normal temperatures through the end of the week. Hazy at times due to fire smoke. Cooling to a little below normal early next week. A slight threat of Sierra crest thunderstorms by the middle of next week. September 6, 2016 at 6:14 PM Per Nevada County Fire JOA: *Update* Vehicle accident HWY20/Omega: 2 air ambulances on order, expect delays in the area and please use caution. September 6, 2016 at 6:02 PM Per CHP Truckee: Traffic alert: I-80 westbound has been re-opened at Hirschdale. Expect heavy traffic in the area. September 6, 2016 at 5:52 PM Solo vehicle accident on Hwy 20 near the Omega Road. Units are on scene, reporting a grey SUV into a tree. September 6, 2016 at 3:34 PM Grass Valley OES 334 has deployed to the Saddle Fire in Butte County. OES 334 met 4 other OES Engines to form a Strike Team this morning. Crews are currently assigned to the line. September 6, 2016 at 3:23 PM I-80 just east of Boca, #1 lane blocked in both directions due to rollover crash. Expect some delays. September 6, 2016 at 11:16 AM Firefighters were unable to locate any fire near Sierraville. September 6, 2016 at 10:43 AM Westbound I-80 at Magra is all clear now. September 6, 2016 at 10:31 AM Report of a vegetation fire west of Sierraville in Dark Canyon on the Tahoe National Forest. Full wildland dispatch on order. September 6, 2016 at 10:05 AM All lanes on westbound I-80 are now blocked at Magra due to a big rig accident and hazardous material spill. Traffic is being held at the Rollins Lake exit. No estimated time of reopening. Use an alternated route if possible. September 6, 2016 at 9:47 AM Westbound I-80 at Secret Town Road, jack-knifed big rig blocking 1-2 lanes. No ETO. September 6, 2016 at 7:13 AM Dry with a warming trend this week, very breezy tonight and tomorrow. 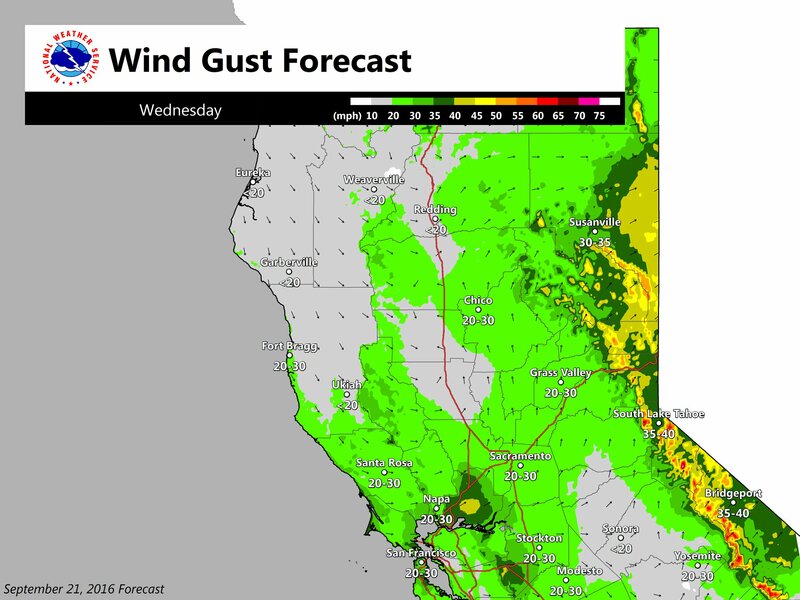 There will be periods of breezy north to east winds at times over the northern half of the Sacramento Valley and surrounding terrain, especially tonight and early Wednesday as a cold front washes out over far northern California. September 6, 2016 at 7:01 AM Report of smoke sen near Stampede Dam and the Truckee river, at the westbound I-80 Hirschdale Road off ramp. Units en route. September 5, 2016 at 8:48 PM Firefighters have located the accident near Penn Valley Drive, single vehicle off the roadway. September 5, 2016 at 8:43 PM Report of a traffic accident, heard only, in the area of Oak Canyon Drive near Penn Valley Drive. Units en route to locate. September 5, 2016 at 8:28 PM One lane on Indian Springs is now open. September 5, 2016 at 7:58 PM Multi-vehicle accident on Indian Springs Road near McCourtney in the Rough&Ready area. Emergency services are on scene, avoid the area while the wrecks are removed. September 5, 2016 at 11:30 AM Per Truckee Police: Labor Day traffic is backing up as people head back to the Sacramento Valley and Bay Areas from vacations. This includes both W/B I-80 and W/B Donner Pass Rd. N/B SR-89 and SR-267 are also backing up. This occurs on many holidays and more often during winter snow events. Motorists are reminded to exercise patience and obey all traffic laws (driving in the bike lanes and on the shoulder is illegal and are common violations during these events). Patrol officers are out in force to ensure everyone’s safety and to mitigate traffic issues where possible. September 5, 2016 at 9:44 AM Warming trend begins today and continues through the week. Warming returns to the region today as ridging from the eastern Pacific extends into NorCal and mostly light northerly flow develops. The last “little bit” of energy will work southeastward today on the back side of the exiting trough. Highs today will be close to average for early September. September 5, 2016 at 9:08 AM Report of a debris fire on the Buttermilk Bend Trail near Bridgeport, a few hundred yards past the sign. 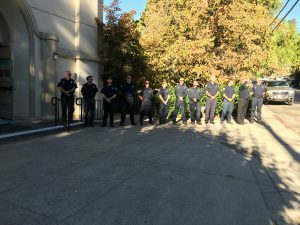 September 4, 2016 at 12:22 PM Unless a fire breaks out – in which case we will of course report on it – we are taking the day off. Happy Labor Day Weekend! September 3, 2016 at 8:32 PM Two-vehicle accident on Lime Kiln Road at McCourtney on Grass Valley. September 3, 2016 at 8:11 PM Smell of smoke noticeable in western Nevada County. Lingering from the Smith and Joines fires, both fully contained. September 3, 2016 at 4:24 PM Report of a multi-family structure fire, reported as a possibly extinguished room fire at the Super 8 Motel on East Hillcrest Drive in Auburn. September 3, 2016 at 4:16 PM Hwy 49 is now open in both directions. September 3, 2016 at 3:58 PM Traffic on Hwy 49 between Labarr Meadows and McKnight is still extremely slow in both directions due to the Smith Fire. September 3, 2016 at 3:57 PM Tanker 88 is leaving Grass Valley, committed to a fire near Fresno. September 3, 2016 at 2:04 PM New start, multiple roadside spots on Hwy 20 in Browns Valley on Joines Road. September 3, 2016 at 11:21 AM A few high clouds today, temperatures will begin to warm up Labor Day. Temperatures will begin to warm up Labor Day as a upper level high pressure system builds in the eastern Pacific, although temperatures will remain slightly below normal for September. High temperatures are expected to return to near normal by Tuesday for the southern Sacramento and northern San Joaquin Valleys, but still slightly below normal for the northern Sacramento Valley. September 3, 2016 at 10:42 AM Multiple accidents on I-80 eastbound, especially in the Colfax area. Please slow down and be aware of your surroundings if you want to reach your holiday destination unscathed. September 2, 2016 at 11:55 AM Good progress on the fire on Camelia Way. Several engines are still responding. September 2, 2016 at 11:47 AM Residential structure fire, with threat to the wildland in Lake of the Pines on Camelia Way. Use caution on Hwy 49 near Combie, numerous engines en route. 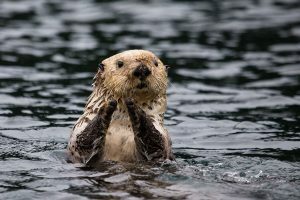 September 2, 2016 at 10:50 AM Planning on going camping in the Tahoe National Forest? Their Yuba River Ranger District and Supervisor’s Office are closing at 1:30 pm, but you can get a campfire permit at preventwildfireCA.org or at North San Juan Fire Department’s Station 3. September 2, 2016 at 8:53 AM Pleasant holiday weekend weather ahead. A low pressure trough along the west coast will bring onshore flow to northern California through the holiday weekend. This will put high temperatures a little below normal each day. A few clouds will move through at times but northern California should remain mainly dry through Monday. The one exception may be some light showers in the Lassen park area Saturday night as a small scale disturbance clips the northeast corner of the state. September 1, 2016 at 3:03 PM Firefighters checked the area of McCourtney, no fire found. September 1, 2016 at 2:21 PM Smoke check in the area of Long Ravine and McCourtney Road in Grass Valley, after a Wolf Mountain lookout report. September 1, 2016 at 7:43 AM Dry weather with a little below average temperatures. A low pressure trough along the west coast will bring onshore flow to northern California through the holiday weekend. This will put high temperatures a little below normal each day. A few clouds will move through at times but northern California should remain mainly dry through Monday. If you are looking for last month’s log, click here. I’ve been hearing several planes around my house, couple of miles south of the fairgrounds. I looked it up on my plane finder app and noticed they are USDF planes. Is there a fire near this area? Anyone know what’s going on? Fire between gv and Alta Sierra? It was posted by the time I asked thanks.